In part 1 of the Challenges and Chances in Healthcare, we explored how indoor mapping and positioning are transforming the way people interact with indoor spaces. By enabling the visualization of spatial data in the context of a map, these technologies make it possible for healthcare institutions to offer indoor navigation and other location based services, such as asset tracking (e.g. of wheelchairs). Misplaced and stolen equipment is a pressing issue that costs the healthcare industry millions of dollars each year. As Post Gazette reports, up to 25% of a hospital’s wheelchair fleet is reported stolen or lost every year. Whether it is intentional or not, Brett Mello, director of information technology at Bronson Health Group, admits that hospital equipment occasionally leaves the building with patients: “We found wheelchairs down the street, at the shopping mall”. Lost inventory also translates to a lack of a means of transportation for patients, which has a profoundly negative impact on patient experience, operations, and workflows. According to the Pittsburgh Healthcare System hospital, personnel were spending approximately 20 minutes of their working time searching for wheelchairs, wasting both time and money. This is another factor that can lead to appointment delays, which in turn causes disruptions in a physician’s schedule. Northern Illinois calculated their costs for lost wages from time spent looking for assets, and it amounted to 4,000 USD every day. That is over 1 million dollars a year. This problem applies to other mobile medical assets as well, such as portable ultrasound equipment, x-ray systems, and many more items which regularly go missing. From 2010-2014, the Santa Clara Valley Medical Center in San Jose declared 383 items valued at more than 11 million USD as missing. Furthermore, more than 50,000 USD worth of stolen equipment surfaced on eBay after disappearing from the United Memorial Medical Center. The issue of lost and stolen assets can also be resolved using Indoor Mapping and Positioning technology. This technology enables healthcare systems to accurately track the location and status of medical equipment. By tagging each individual item with a sensor, assets can be monitored in real-time, and their location can be displayed in the context of a map. Additionally, the picking up of patients can also be managed in the backend, making the traditional sign-out system obsolete. With asset tracking, you can see where assets are within a facility, and be notified should an asset be abandoned or left somewhere remote. Furthermore, once an asset leaves the building, an alarm can be triggered to immediately alert management, initiating measures to have it returned. By combining inventory tracking with personnel tracking, the hospital management can locate the employee closest to any abandoned wheelchair and assign them the task of returning it accordingly. With an indoor mapping and positioning solution, hospitals will not only improve the retention rate of mobile assets saving them millions of dollars, over time they can begin to scale down on the number of assets required from improved and location-based management. 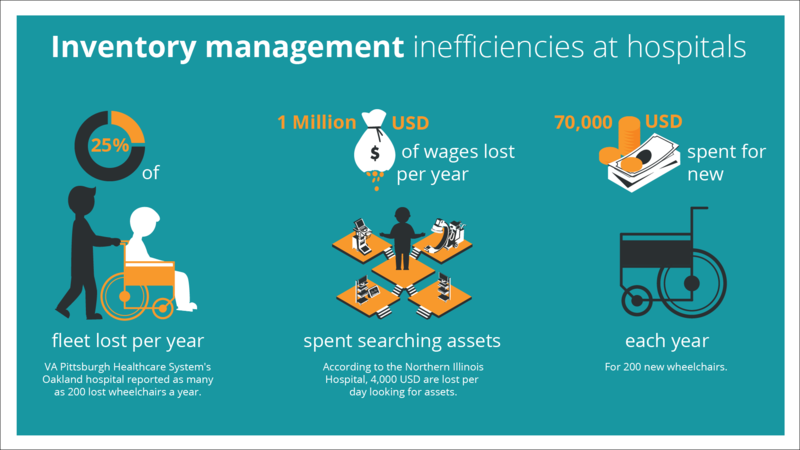 Find out more about Asset Tracking and PRM Management in hospitals.